On average, 1 out of every 2 companies across the world already use enterprise applications. This trend is likely to grow stronger next year – with hybrid development technologies assuming particular importance in this context. Developers will start to use tools like AngularJS, Ionic, Sencha Touch, PhoneGap and Cordova more frequently, for agile hybrid app development projects. The steadily increasing popularity of hybrid technologies can be attributed to the surge in the Bring Your Own Device (BYOD) practice on a global scale. It has been forecasted that demand for mobile enterprise apps will be about 5 times more than the combined supply capacity of developers. How the latter tackle this challenge remains to be seen. It has been found that nearly 75% of all smartphone users worldwide prefer using applications with reliable cloud support (server-side backend support). The prime reason for this is the increased need for accessing apps on multiple devices – without any loss of data and/or other usability problems. With extensive use of cloud-based technologies, both integration as well as multi-device synchronization of apps will become more and more seamless. In addition, developers would get more flexibility while coding, testing, as well as launching their applications. Cloud technologies will also help in shortening the overall app development cycle, boosting the average ‘time-to-market’ span for developers. Note: For smooth and fast web-connectivity, the demand for APIs is going up rapidly. These software tools ensure robust cloud-based support (Backend-as-a-service) as well as improved interoperability/interaction between multiple apps. The total number of mobile app developers with advanced coding expertise and high experience levels certainly cannot match up with the overall demand for apps. To address this skill shortage, various do-it-yourself (DIY) mobile app development tools and techniques are being deployed by non-programmers. Since platforms like PowerApps (by Microsoft), Mobile First (by IBM), and those launched by Telerik and Exicon are all based on automated development methods and a basic WYSIWYG design (with custom templates, drag-and-drop functionality, etc. ), it will become easier than ever for the average Joe – who knows not much (or nothing at all!) about coding – to churn out mobile apps for different platforms. This aptly-named ‘Citizen Developer’s trend’ (for Low Code/No Code app development) will be something to really watch out for in 2017. In 2015, around 80 Internet of Things (IoT)-related acquisitions were made across the globe. Cut to 2020 – and the number of separate, connected devices will be inching towards the 28 billion mark. Revenues and profits from the IoT industry are already surging, and it won’t be a surprise if these figure show a two-fold increase over the next 12 months or so. The onus will be on developers to create apps that take advantage of smart device sensors to securely exchange personal information over wi-fi networks. Note: With Apple Watch gradually becoming more of an autonomous device – and less reliant on paired iPhones – the growth opportunities for IoT (often referred to as Industry 4.0) are only getting wider. As the mobile app industry has grown, so have (unfortunately) the number of security threats and attacks. Features like two-factor user authentication – generally used for mobile banking – are becoming fairly commonplace. At this year’s Apple World Wide Developers Conference (WWDC), it was announced that it will become mandatory for ALL iOS applications to have the robust App Transport Security, or ATS, feature by the 1st of January. Importance has also been placed by Apple developers on implementing stronger data encryption in new apps. With so much fragmentation and a decentralized OS integration, security on the Android platform will always be slightly more suspect. Even so, Google is attempting to keep things tighter, by using a much more granular app permissions model and automatic security updates (on the new Android versions). The in-built security features in Android phones are also growing stronger. In 2017, expect app security to be right at the centre of attention for app makers. Going by the rage that Pokemon Go became this year, you can add augmented reality (AR) to that as well. Professional mobile app developers report that they are receiving a large number of projects for new apps that use the location-tracking/navigation functionality of handsets. What’s more, such GPS-powered mobile apps are finding acceptance in several industries – right from automation and retail, to, obviously, the IoT. Augmented reality is something 3D game developers are seriously looking at – to enhance the engagement levels of their software. Initially, users were apprehensive of letting their locations ‘known’ to the server through GPS, but that concern is steadily dissipating. In a recent survey among Hadoop – the popular open-source framework used for distributed processing and storage of large datasets – 76% respondents stated that they will be using the tool more extensively in 2017 (a measly 3% stated the opposite). Coders are likely to become more careful about maintaining just the right balance between user-friendly interfaces and reliable, enhanced functionality in these big data applications. It won’t be long before we witness cutting-edge mobile applications that combine IoT, cloud connectivity, and big data processing features. Note: Want to know how to make big data applications? Head over to this post. We touched upon this point very briefly earlier. Let us now find out how big enterprise app development is indeed likely to become in 2017 and beyond. In the United States, more than 50% companies are expected to start using 10+ mobile enterprise applications in 2017. Two factors have, in particular, fueled the recent surge of interest in enterprise applications. For starters, they make it easier than ever before to maintain 24×7 interactions with customers (existing and potential). Also, with custom mobile apps for business, day-to-day management tasks become a lot easier. Most US companies will have workers will use 3-4 smart devices, with wearables also becoming popular in this regard. By January 2016, Apple’s Swift programming language had leapfrogged Objective-C in terms of popularity and usage, on the TIOBE index. The fact the language had become open source from December 2015 definitely added to its adoption rates. Most iOS app developers also confirm that Swift is an ‘easier’ language to learn and use than Objective-C (which carries all the legacy systems of the C language). Swift 3.0 was released by Apple last month, with a plethora of new, developer-friendly features. In 2017, there is reason to expect that Swift will be extensively used to make apps for iOS, watchOS and even tvOS. Objective-C won’t go into oblivion or anything – but its application is likely to go down. It has always been the same: Android has a big lead over Apple iOS as far as worldwide market share is concerned, while the latter wins hands-down when it comes to revenue for developers. In 2017, Android might consolidate its position as the market leader further (in terms of device share). In the second quarter of 2016, the platform had a market share of 87.6% – up by nearly 4% on a quarter-on-quarter basis. On the other hand, the growth of the iOS platform has been patchy at best, with the share falling to 11.7% in 2016 Q2 (a 3.7% QoQ decline). In terms of app revenues though, iOS is still way more profitable than Android. At WWDC 2016, it was announced that the Cupertino company had paid out approximately $50 billion to its developer community till now. Comparatively speaking, revenues from iOS apps is 100% more than that from Android apps – and the stats are exactly the reverse when app downloads are concerned. iOS, as expected, had traditionally held the upper hand over Android, in the domain of mobile games and their revenues. However, things are set for a overhaul by mid-2017, with revenues from Android games overtaking that from iOS games for the very first time ever. By 2021, total revenues from mobile game development will touch $72 billion. During this time, Android will establish itself as the most profitable games ecosystem (but not the most profitable app marketplace). With support from the Android stores in the emerging markets (read: China), Android is expected to gradually outpace iOS in gross game revenues. Note: It is an interesting point that although the mobile app market has entered ‘early maturity’ and the cumulative game download figures have gone down slightly, the average revenue-per-download figure has kept rising. It was $0.35 in 2015, and is expected to climb to $0.51 by the end of the decade. Designing a diffused background is, obviously, not possible for all types of applications – but this is a trend that is certainly catching on among app developers at present. Many coders and designers are opting to build diffused backgrounds for their apps, with highlighted call-to-action tabs and buttons, and easily clickable areas. The logic behind this is to allow users focus on the main features of apps, with the backgrounds providing minimal distraction. That’s a characteristic any good mobile app should have! With so many IM applications available at both Apple App Store and Google Play Store, you might expect that the interest of smartphone-users in these will have waned a bit. The stats, however, show that the case is quite the opposite. Facebook Messenger is still one of the three most popular applications in the United States, the global user-count of WeChat has gone beyond 500 million, and other leading messaging apps are also showing strong adoption and growth figures. In 2017, expect many more instant messaging/chat apps to be launched at the stores – each with its unique set of functionalities. This is one app category that will stay strong in the foreseeable future. User-experience is, and will remain, the single biggest parameter for measuring the success (or otherwise) of a mobile application. Mobile app companies have started to invest more for recruiting teams of expert graphic artists, illustrators and animators – to make applications more visually appealing, user-friendly, and with smoother in-app navigations. In 2017, newer trends will emerge in things like parallax graphics, grid-based interface designing, split-screens, splash screens and visuals, and microinteractions. To put things in perspective, it should be noted that UX designing has steadily evolved over the last few years. What started out as simple flat designs for Android apps, have now become the much-talked-about Material Design of Google. Note: The need for mobile apps to have great UX is fairly easy to understand. People should be able to start using an app easily, and not feel motivated in any way to quit/abandon/uninstall it. The keyword here is ‘user-retention’. And in a big way too. Tools like Apple Pay, Google Wallet, and (to a lesser extent) Square Cash have given a big boost to NFC-powered contactless payments by users. By the end of 2017, there will be many more custom software at the app stores that will enable retailers facilitate m-payments, in a prompt and secure manner. Mobile transactions will make up nearly 50% of all web-based transactions. In essence, the conventional e-commerce resources are gradually changing into m-commerce tools. Over the next few years, mobile apps will find increased usage in a large number of new industries – right from agriculture and manufacturing, to automobile, transportation and healthcare. Developers will find new ways to incorporate beacon technology (via the iBeacon network) in new apps, to boost their utility levels. The importance of HTML5 hybrid app development is all set to increase, and overall mobile ad revenues will show an upward trend. Making apps for wearables (with Apple Watch at the forefront) is yet another vital mobile app development trend for the next year. 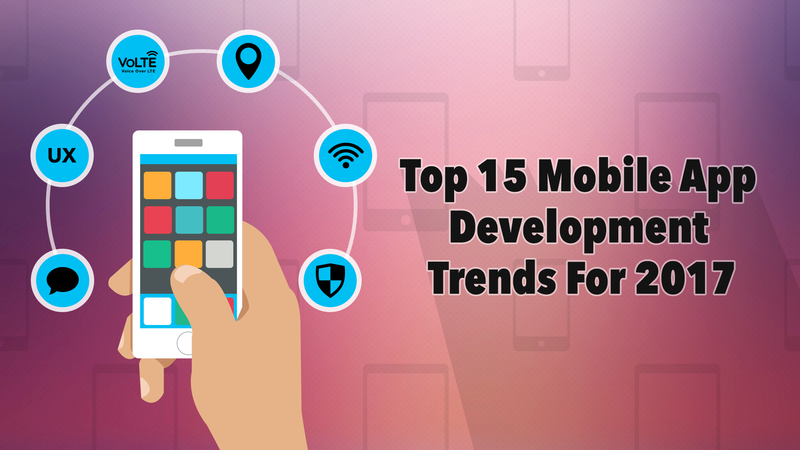 2017 is going to be a big year for mobile developers – with the need of the hour being the ability to adapt, analyze and innovate. It will be interesting indeed to note how app-making technologies evolve over the next few quarters.